Barnsley have already had some memorable moments this season, but few goals will have made them happier than Kieffer Moore's late winner against Southend United. The Reds, when at their very best can blitz most teams in League One, but more recently they are finding out they can also grind out the wins too. This was far from one of those Red Letter days, like the 4-0 win at Peterborough, but they kept going against testing and obdurate opposition and they eventually got their reward. And as it turns out there are few feelings better in football than scoring a late winner. Oakwell erupted when Moore climbed highest from Alex Mowatt's 87th minute corner to head home his first goal in six games. It brought a second successive home 1-0 win, following last week's success over Bristol Rovers, on an afternoon that looked like it would never come. As good as the 4-0 wins have been – and there have been three of them – the narrow wins are just as important and suggest that Daniel Stendel's men are real promotion contenders. Having a fortress also helps of course, and the win means the Reds are unbeaten at Oakwell in all eight of their games this season. “It is the basic for us to take points in home games,” Stendel said. “It is also important for our fans that we give a little bit back to our supporters who give us great support at away games. “This is our task that we give our supporters points when we play home games. “It was also in the last minute, which makes it happier than when we score in the first end. 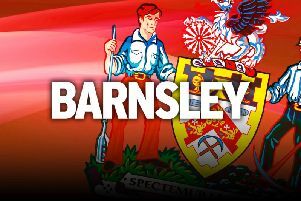 After a strong start by the visitors, Barnsley began to take control and had two good chances on the stroke of half-time as Moore's vicious volley was saved by Mark Oxley and then Brad Potts drilled a volley just wide. Those two players were denied by the woodwork in the second half as Moore's header glanced the crossbar, which was left rattling two minutes later by Potts' firm strike. It looked like being an afternoon of frustration until Moore does what he does best and popped up with three minutes later with his eighth goal in 15 games this season. "I thought in the second half that we were the only team trying to win the game,” Stendel added.